My husband found a super delicious recipe for us to try out. We have been looking for creative ways to eat healthier so we don’t go insane by eating chicken and veggies. This recipe is so good and also added a few things. When we saw this we wanted to add black bean paste on 6″ corn tortillas. I got a can version of it and spread it on the tortilla after I warmed it up a little. I also added some purple shredded purple cabbage on top per hubby’s request for texture and taste. In a large bowl of water, soak corn for 30 minutes; drain well. Preheat grill to medium high heat. I used the stovetop. Brush corn with corn oil and add to grill. Cook until grill marks appear, about 3-4 minutes on each side; let cool before cutting the corn kernels off the cobs. In a large bowl, combine corn, mango, bell pepper, onion, lime juice, cilantro and salt, to taste. 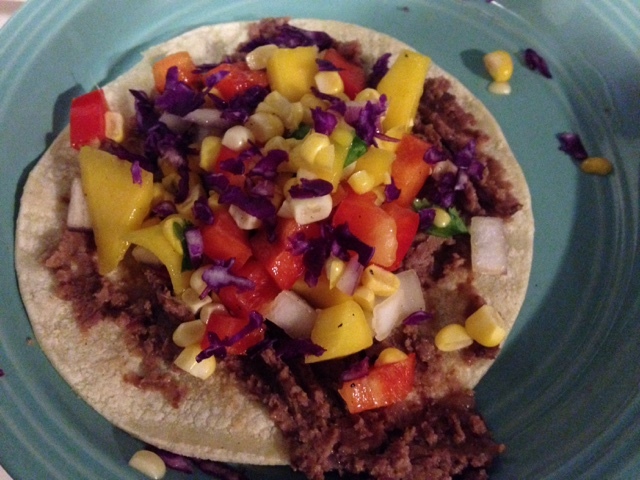 Black bean paste on corn tortillas. 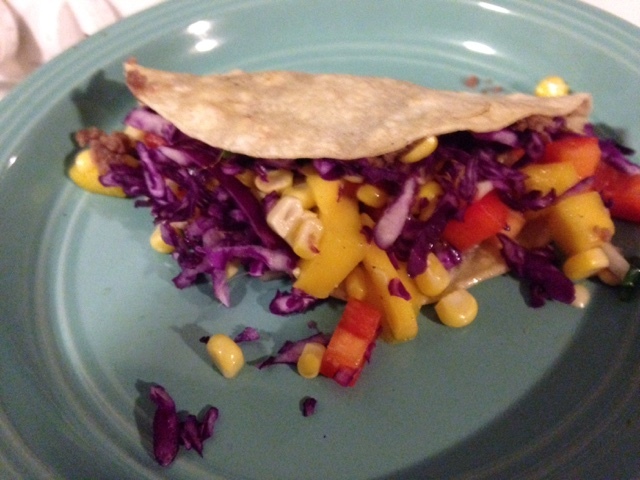 Added the above salsa and add shredded purple cabbage on top- about a pinch.